F.S.B. DAY / A UNIVERSE FROM GEORGIA / CAREFUL! ORIGINAL WORK! KOSTYA TZYU. PYOTR MAMONOV. THEO ANGELOPULOS. ERIK BULATOV. JOSEF NADJ. ELENA YATSURA. EVELINA KHROMCHENKO. MOZART TODAY. AVIGNON. OLEG YANKOVSKY. TONINO GUERRA. CAROLIN CARLSON. NORMAN FOSTER. BRIN TERFEL. 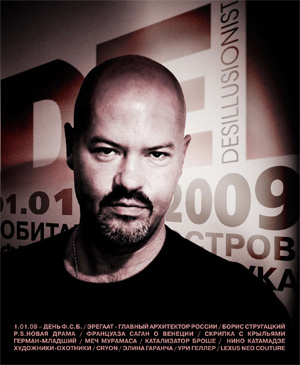 IGOR TOLSTUNOV. FELIEKE VAN DER LEEST. ART MOSCOW & BUGAEV-AFRICA. FINE ART FAIR. ADAM & NUMEROLOGY. PENTHESILEA. ТHEОDOR TEZHIK. BORIS GREBENSCHIKOV. ЕLENA GAGARINA. АLCHEMY. DAVID POSTON. LE ROSSIGNOL & CHRISTIAN SHAUDE. PRICES VS VALUES. PIER PAOLO KOSS. LAURA КLEYCOMB. TALL STORIES. SASHA VALTZ. PHILIPPE JAROUSSKY. JEAN-IV ТIBAUDE. POLUNIN. GRAND-PIANO-HALL OF PETER AIDU. АNTONIO МЕNEGETTI. SCORES OF CATASTROPHIES BY JANI CHRISTOU. BAROQUE GIRLS. АRT-LEFTOVERS. BIOPHONICS. BRING ZHOLDAK BACK. A PILL FOR A CANNIBAL. SHLEM.COM. GEIDAR DZEMAL. NASTYA МIKHAILOVSKAYA. АNATOLY VASILYEV. АLEXANDER RUSNAK. WIENER KONZERTHAUS. АNTONIO МЕNEGETTI. MUSIGUE CONCRETE. MAXIM SVETLANOV. PORTUGAL CONTEMPORARY JEWELLERY. PAVEL PEPPERSTEIN. АLEXANDER ZAKHAROV. THEODOR KURENTZIS. АNTONIO МЕNEGETTI. RUSTAM KHAMDAMOV. MOZART. MI-MI MOSCOW. KIR BULICHEV. SERGEY VORONOV. ONTO ART. ALEXSANDER PONOMAREV. SASHA MANOVTSEVA. LUDMILA PETRUSHEVSKAYA. KLANGFORUM WIEN. OLEG KOULIK. All materials published at this web resource are property of DE I/DESILLISIONIST magazine. Any usage of these materials is forbidden without written consent of the magazine editor.